Ooh, it's starting to feel like Spring around here guys!!! We've had blue skies, 70-degree weather and gorgeous sunshine the past couple days and I am in LOVE. I've been working on several furniture redos that I'm dying to show you...so be on the look-out. You can see some sneaks as to what they are on my facebook page. I'm pretty sure I'm not the only one with that love affair though. No stuffing placemats this time! Wanna see what I came up with?? I first used it back when I did my kitchen stool makeover and I'm super impressed with how it holds up- especially since a four year old eats there regularly!! I swear, we spilled a big amount of spaghetti sauce and it came up! 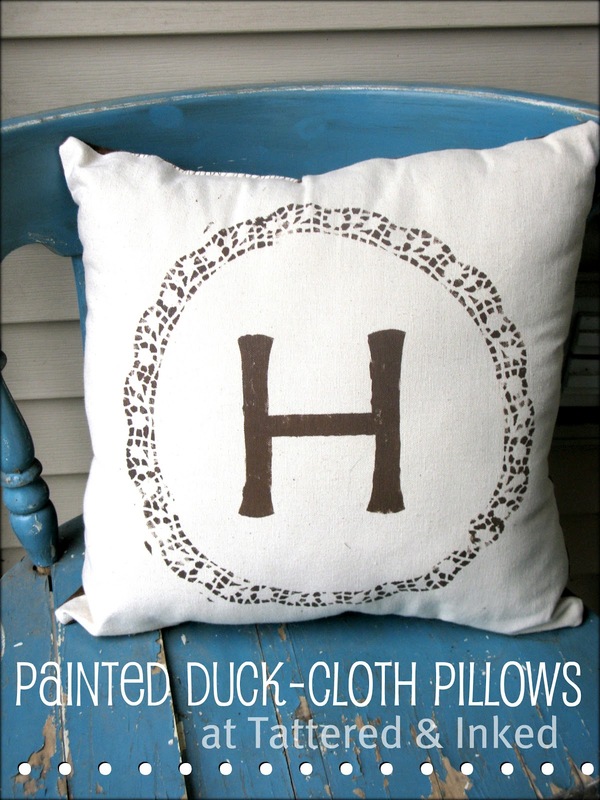 I found mine at JoAnns fabric and the label calls it 'duck cloth' and it just feels like drop cloth material. 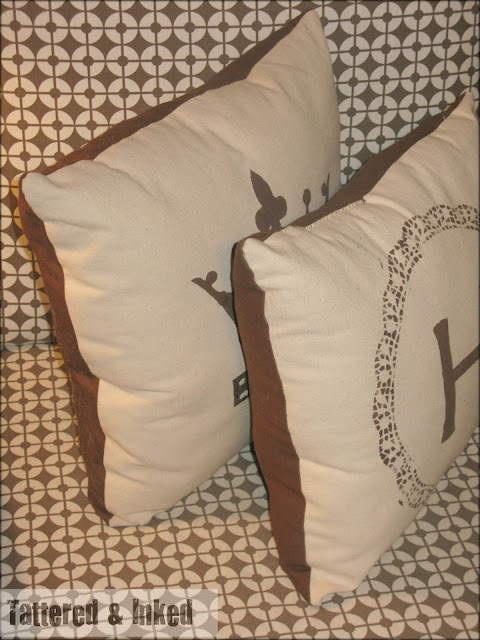 So I picked up the two colors in enough yardage to do a couple pillows. 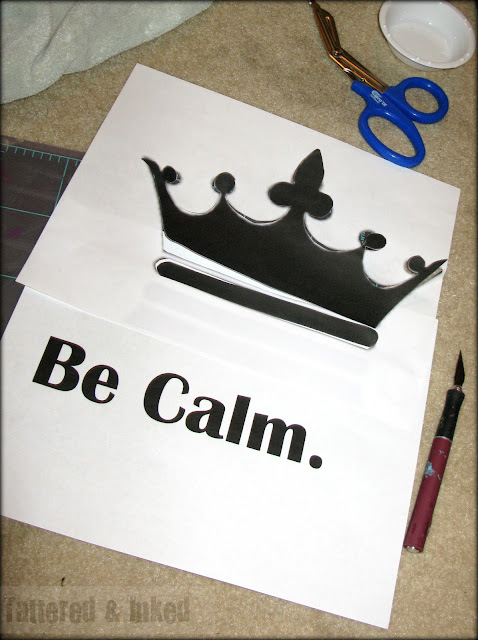 I decided I wanted to glam them up a bit with some vintage-y type painting so I printed out some stencils. 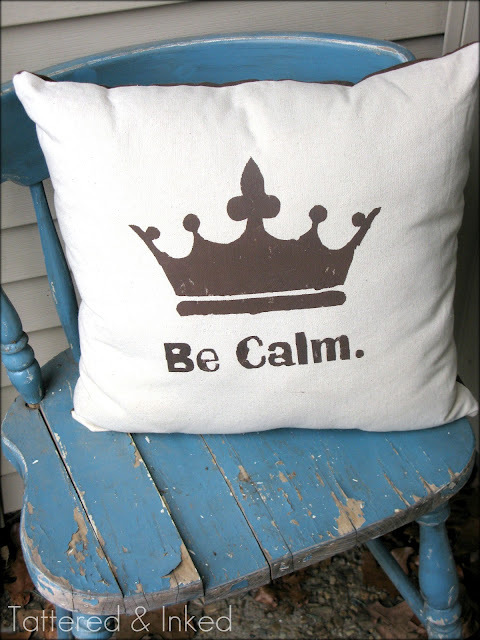 I still love the whole 'keep calm and carry on' slogan and used it to inspire my 'be calm' pillow. I then used regular old acrylic paint to stencil them on with a little round pouncer. 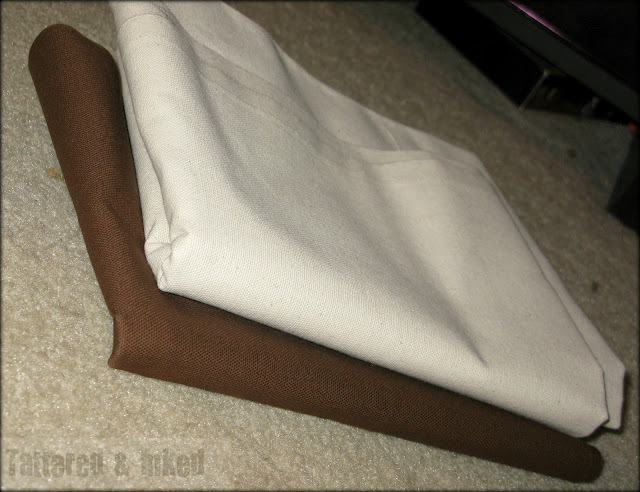 You can also pour a little fabric medium into your paint to make it a bit softer but these aren't really for laying on so it didn't really matter. To make my "H" pillow, I painted the H on and then used a paper doily I had to get the circle imprint. I just laid it on the cloth and pounced some paint into the design. I love the contrasting brown on the back!! I took some fine-grit sandpaper to the paint to rough it up a bit to give it more of a vintage feel. Need some more vintage pillow eye candy in your life?? Are you excited for Spring like me?? Oh my goodness! These are beyond perfect...I am going to have to make my own! 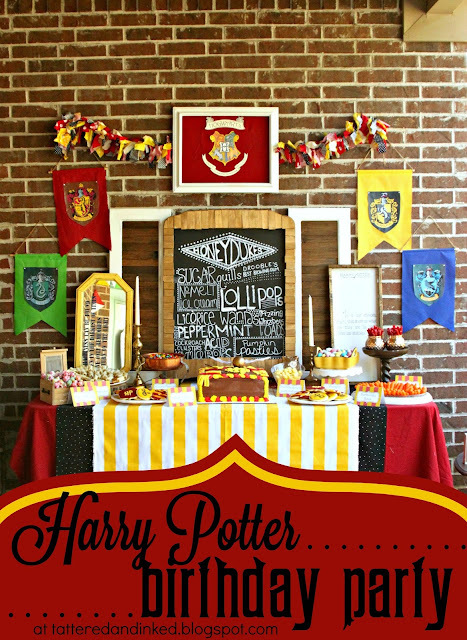 I am hosting a Link Party today and would love for you to add these, and anything else you like! So cute! Love the crown! Those look great! I love to work with duck cloth. I used to make bags out of it. I have entered into all those silhouette give-aways with no luck too. 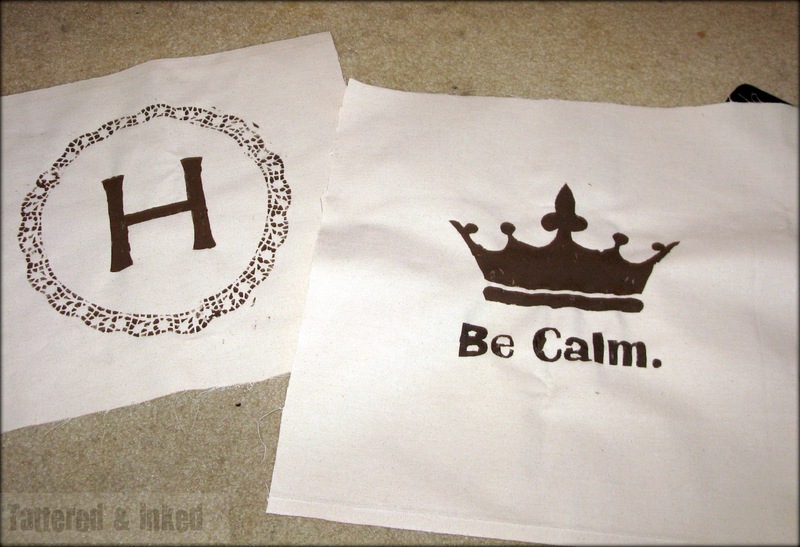 :( I haven't tried to print out a design and cut it out. I'm definitely going to give this a try. Thanks for the inspiration! I look forward to exploring your blog for more great ideas! I am following you through Linky Followers. Hope you visit and follow back. Thanks! Have a wonderful day! How stinkin' precious! Those pillows look amazing! Wow! We're your newest linky follower and we look forward to coming back soon to be inspired again! We think you'd love See Beautiful too! So pretty! I love the lacy edge on the monogram especially. Feminine but no over the top. Well done! Would you link up if you have time? So cute... I too love to paint and print on fabric so I just loved these. Ummmm I think I need to steal that beautiful blue chair!! Adorable pillows. 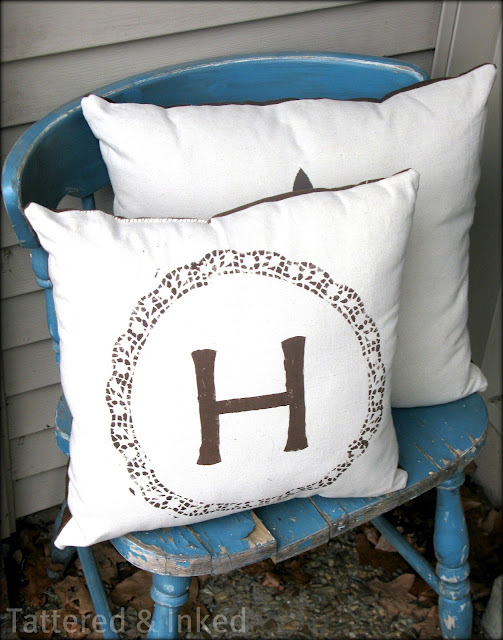 Great idea to use duck cloth. Thanks for sharing at oopsey daisy! Featuring you tomorrow during Sticker Time!